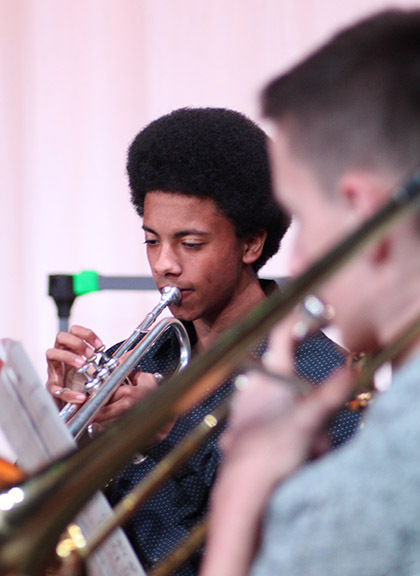 Musicians at The Sixth Form College, Solihull ended the Spring Term with a public performance, as the annual Easter Concert took place. Students on the A level Music course were among those performing. Their solos featured music on cello, flute, classical guitar, piano, trumpet and tuba, as well as some vocal performances. There was also a performance from the Jazz Group and a student band (Goodband), while the College Choir (consisting of staff and students) performed six songs. Two of the gifted Music students who performed at the Easter Concert are celebrating achieving their grade 8 piano with Distinction. Hannah Lindsay and Alex Borland are in Year 12 and both have achieved this very impressive feat, which is above the level that required for their recitals.